My cat is sneezing. Why won’t the vet give antibiotics? Upper respiratory infections (URI) are fairly common in cats – it’s like a human catching a cold – and since these infections are caused by viruses, antibiotics won’t help. The symptoms are usually similar to a human with a cold; sneezing, runny nose, and runny eyes. These types of infections often pop up when a cat has experienced a lot of change, or in groups of cats. It’s like when children start in daycare or at the beginning of the school year and they all get sick. Kitty colds do not transfer to humans, or the other way around. Antibiotics work on bacteria, not on viruses. Giving antibiotics anyway will not make the cat feel any better, and might make any bacteria present to become resistant, causing the medicine to lose effect. Many feel their doctor or veterinarian should prescribe antibiotics anyway, but the world has an increasing problem with resistant bacteria, and doing so can cause severe problems in the long run. It’s not about a specific person or a specific pet becoming resistant to antibiotics – it’s about a strain of bacteria. Once that happens, our regular medications will be useless on everyone who encounters the disease. 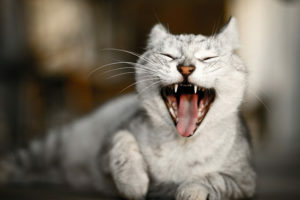 If your kitty is sneezing, has runny nose, and/or runny eyes, visit a veterinarian. If they don’t prescribe something, it’s not because they don’t want to help – it’s because it wouldn’t do any good.